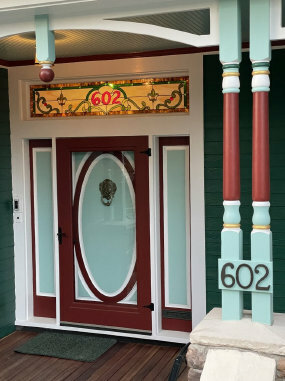 Mr. Dudley called me about building a transom for his newly built Victorian style home in the middle of a 100 year old neighborhood in Rockville, Maryland. 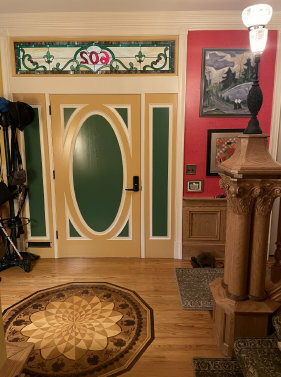 He said that most of the period houses around him had transoms over the front door with the street address in the transom. He liked a Victorian style number transom that I had built for an 1883 hotel in Custer, South Dakota .... The Kleemann House Hotel. His transom was a good bit longer, so we re-arranged several design elements but kept the original concept intact. The Dudley Transom measures approximately 15" x 74" and contains 153 pieces of glass. It was completed in August of 2016 and is now over the front door of Mr. Dudley's home in Rockville, Maryland.